An annual international jazz party, Ubud Village Jazz Festival (UVJF), is back for its 6th year on August 10th and 11th. Pre-event concerts will be held in numerous venues around the island a week before the festival, and The ANVAYA is proud to host one of these events, highlighting a performance by YA! Voices. This group of five professional Japanese female singers and players create funky music with a touch of Gospel, R&B, Jazz and traditional songs. 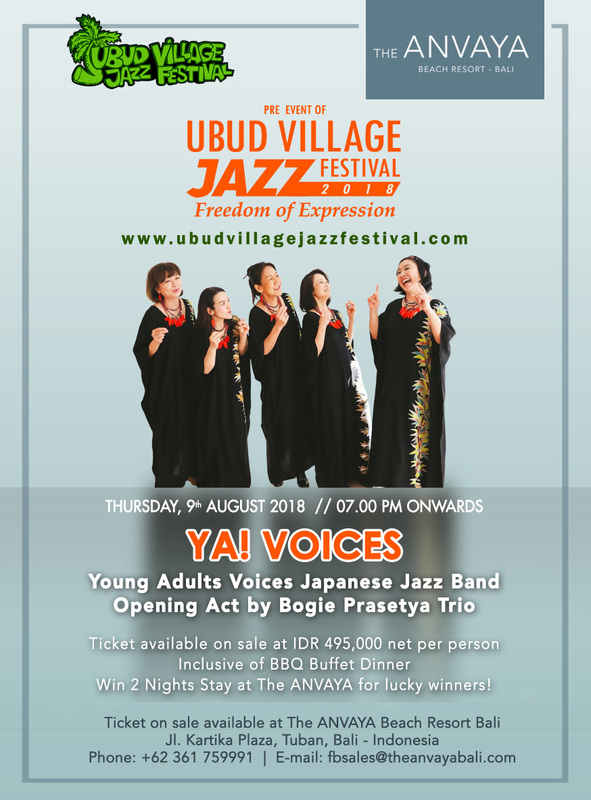 The UVJF 2018 pre-event at The ANVAYA will be held on August 9th at 7 PM. Tickets are priced at IDR 495,000 nett, which includes a BBQ Buffet Dinner at Sands Restaurant.